I recently received a message from a fellow school counselor who was part of my Master of Education School Counseling cohort. She sent a message to our entire graduating cohort to check and see how we were all feeling and faring as school counselors. At only 7 years in, I expected people to be talking about finally feeling established, making change (albeit slow), or realizing how much this career offered them personally and professionally. What I read was the complete opposite — people are exhausted, people are frustrated, people are losing hope. Some had already stopped with school counseling and moved into private counseling practice. Some had decided to move back into the teaching classroom or go for an administrative certificate hoping it would be “easier.” Some talked about declining funding, positions being on the chopping block, or being over dealing with combative parents. From my cohort’s response it did not seem that any one individual was experiencing true joy in their counseling role. I shut down the email chain and felt so deflated. Why? I struggled to relate to my friends comments, complaints, or concerns. Their words were not mirroring my experiences. I love being a school counselor. I enjoy going to work every day. I find joy in my position, my role, and my interactions. More importantly, I was deeply saddened by the fact that a group of powerful, caring, compassionate school counselors could be feeling so bad and so tired that they were considering giving up the trade. I have spent a lot of time reflecting on what is different for me? What I kept coming back to was a few established beliefs, norms, or practices that have helped me stay focused, achieve work-life balance, and maintain the joy of counseling. In the hopes of maybe sparking a new practice for fellow school counselors who might be tired and questioning their choice to counsel — here are my tips and advice to staying bright and energized and not burning out. … Make time for me. This ties into number 1. Once I am done with work, I am focused on “me” time. I workout. I reconnect with my husband. I read for pleasure. I meditate. I connect with family. I cook and consume healthy meals. I try to not let work thoughts seep into this time which allows me to honor who I am with and what I am doing. I don’t feel selfish. I feel balanced and refreshed. More importantly, I feel renewed to counsel the next day. I recognize my limits. I am one individual. I have a huge caseload. I realize that I am not a magician and that I am unable to make things better for every human. I do what I can and celebrate the small victories. I am honest with people about my time and my limits. With this I don’t feel like I am letting people down or failing them. I let go of false expectations of being a super-woman and just do what I can in a meaningful way. I surround myself by marigolds. While it is important to vent, it is also important to stay positive. The negative weighs on me and makes me feel gross. So, I choose to not put myself in that environment. Rather, I celebrate with those who are like minded and find the joy. I do not search for extra. I think it is a personality trait of many counselors to want to know everything going on in a school. NOT ME. I have always said as a counselor I hear a lot of things every day. If I don’t have to hear/know more that is great with me. In other words — I do not need to know the “gossip.” If someone chooses to not share with me I am okay with that. I don’t feel like I am missing out. If a student goes to another adult and is supported and doing well, beautiful. I don’t need to insert myself in just to feel like I have the inside scoop. I carry enough and am not hurt by not knowing something that really I do not need to know in the first place. I take joy in my daily interactions. I love working with students. There is something good in everyday. I recognize it. I notice it. I celebrate it. When you experience joy it really is hard to feel weighed down or burnt out. I try to not personalize things. Like a duck, I let things roll off my back. When students, parents, or teachers are hurtful I acknowledge they are not attacking me. There is something that is hurting them and I just happen to be on the receiving end of that misdirected anger/sadness/frustration. It’s not me. It is bigger than me. I can support but I will not absorb. I refuse to be stagnant. I am always developing and trying new things. I think burnout occurs when we are stagnant. So I take risks, develop new learning opportunities for students and staff, grow as a professional, learn from those around me, create, innovate, and then reflect. It keeps me on my toes and keeps me focused on how things could be (and how I can get them there). I seek feedback. I ask parents, students, and staff to help me grow as a professional. I want to hear what I could do different to support students and develop authentic learning opportunities for students. By asking and putting myself out there, I have found that people are willing to offer areas for growth and development. In this way I am constantly aware of how I am doing and how to improve. I feel noticed and like what I do really matters. I also get the occasional recognition of something I have done well which is always a confidence booster in itself. I live by the South African Proverb: “How do you eat an elephant? Bite by bite.” I recognize I am a small cog in a large machine. I do what I can, when I can, with meaning and intention behind it. Bite by bite I do believe that I — as a school counselor — makes a difference. So, here is to my friends and fellow counselors refocusing and refreshing and reigniting their joy. Here is to an amazing group of thinkers, educators, and believers who I know do amazing work for students. Here is to not giving up hope and not hanging up the towel. Here is to school counselors — around the world — with careers that are long, satisfying, healthy, and meaningful. Be well. As a school counselor, I am used to transition. In a comprehensive counseling program, transitions are an integral piece of student support. I help students transition from one grade level to the next, one division to the next, or in and out of schools. I am also used to supporting staff in transition as people come and go, move divisions, change positions, retire, or accept another job at another school in another country. Transitions are normal, healthy, and in my wheel-house. I know what to do, how to process, plan, and support .. when it is someone else’s transition. Personally, I am going through a major transition in about every capacity of my life. In the past 4 months I have said goodbye to friends and students, packed up my life, moved halfway around the world, started a new job, in a new country, with new coworkers, programming, students, staff, and more. About every major transition you can possibly experience, I just did in the span of a few months. And guess what? … I have felt lost and floundering. I have been struggling with my own transition and making sense of who I am in time and place. So, I did what I do for others — I sat down and drew up a transition plan. Except this time the person who I was supporting and developing a plan for was myself. Here are the elements of my transition success plan and what I did to be kind to myself and make sense of what I was going through. I identified my support group. I clearly outlined who could help me in my transition. Who would understand the various pieces of what I was experiencing and be able to support me through those aspects? Who would be gentle enough with my emotions but also provide tough love and alternate perspectives to my thinking? Who was already not overwhelmed with their own life so that they were open and willing to let me lean on them when needed? Who could support me personally? Who professionally? I quickly realized it was not fair to my husband to be my sole support as he was in the same stage of transition. Rather, I reached out to a few family members, some old friends, and some new staff who were in the transition boat right along beside me. Each were able to help me in a specific way that was not overwhelming to them or me. I clearly defined what support looked like to me. As I discuss in this post, I clarified specifically what support looks like for me so that my needs were met in a manner that felt meaningful for me. I spoke what I needed and was willing to ask for help. Sometimes my support had everything to do with school. Sometimes it had nothing to do with school. I was just clear in what I needed at my transition at that moment to set myself up for success instead of disappointment. I found my slice of “normal.” To ease transitions, I am a firm believer in establishing routines and settling in. This meant I identified what I needed both personally and professionally to feel like I could conquer the day in a manner that felt true to who I am. Coffee maker in the kitchen. Planner filled out and updated daily. A comfortable couch to curl up on at night. A gym membership to maintain my workout (aka sanity) schedule. A really good pencil sharpener and a set of pencils. Knowing where to access the daily schedule. Knowing what standards guide the counseling department at my new school. Once I had those pieces of “normal” figured out, I felt more settled and like life was not so different after all. I allowed my emotions to be. I named my feelings. I acknowledged what might have made me feel that way. I sat in the emotion for a while and honored it. Then, I did something to move through it instead of letting it swallow me up. I did not apologize for pure glee. I did not apologize for pure sadness. I recognized there was a reason that emotion surfaced and then I moved through it. I created “triage lists.” I created three different sets of lists: What needs to be done/known/understood now? What needs to be done/known/understood soon? What needs to be done/known/understood in the future.” This helped me break life into manageable pieces. It also helped me understand that there were things to focus on now and gave me the grace to push some things to the back burner. Instant grace. Instant clarity. Instant focus. I embraced the new and I stopped comparing. I realized I was packing a pretty hefty “back home” or “at my last school” suitcase. That was not fair to my new situation to compare or score one item against another. It also did not allow me to fully embrace the new and engage in the change process. I realized that as long as I was constantly comparing I was not fully embracing. Transition means reflecting on what was while also looking forward to what will be. So, I stored that suitcase away in a closet and opened myself up to being vulnerable, unsure, unsteady, and ready to tackle the new. As I wrote and worked through my transition plan I realized that just like every other individual in transition, having some tangible actions to focus on helped make the unmanageable seem doable. The scary become less overwhelming. I seemed to move through the chaos quicker and found my semblance of normal. The plan helped me clarify my goals and gave me a sense of purpose while still honoring the change, emotions, and fear that goes hand-in-hand with transitioning. Most importantly, I reflected on how essential a solid, individualized, student-centered transition plan is to support students through change. I more fully see the benefit of a comprehensive plan that meets student needs as they move into the next unknown. What are some ways you support student transition? How have you supported yourself in a major transition? What would you include in your transition plan? What Makes School Counselors Special? In honor of National School Counseling week, a list of traits, qualities, and attributes that I believe make school counselors a unique, critical, integral, and valued part of a school community. They are specialized educators who have a deep passion and knowledge about school counseling. School counselors are educators who have a master of education in school counseling. They have passed board certification and are members of a professional school counseling organization (ASCA and ISCA shout out). School counselors made the choice to become a school counselor because they believe in the value and impact of counseling in the academic setting. They did not just “get” the job because they were “nice” or “smiled a lot” (though both of those do tend to be true statements). They appreciate silence. Counselors are great at allowing space for silence. Long.Awkward.Painful.Silence. We know that silence allows time for reflection, thoughts to be formulated, and for honest response that might not be shared if silence is not allowed. We can sit in silence and appreciate it for all that might be happening in that space and time. We don’t feel out of place with it but actually relish the power that silence has. They are a perfect balance between being empathetic and pragmatic. Counselors are not bleeding hearts. It is a common misperception that we are overly-emotional, highly-sensitive individuals who can solely focus on feelings and emotions. Not exactly true. We might have a highly developed sense of empathy but we also have the ability to put emotion aside to focus at the issue at hand. We set aside emotion to support a student and focus on solutions. We use logic and reasoning to support a student, staff, or parent in crisis without becoming the crisis. While we understand empathy, we realize that being too empathetic hinders a counselor from doing her/his job. They are experts at unpacking. School counselors help unpack thoughts, ideas, problems. They help unpack questions, concerns, and conflicts. They help unpack anger, sadness, and frustration. They unpack all day everyday to help people think about their thinking and make sense of what direction to head next. They are highly skilled at time management, triage, and organization. Like I have mentioned before, a school counselor’s time is not her/his own. Being able to assess a situation and prioritize tasks is a regular part of a school counselor’s job. While there might be a general idea of what a day will hold, being able to adapt to support students is what the role is all about. Finding times and ways to flex your schedule and work-load is not a point of stress for counselors — just a norm. Rescheduling a meeting, canceling a group session, and putting guidance planning on hold — all with a smile on your face — is easily done if it means supporting students. They feel comfortable on the iceberg. School counselors have a very unique role where still many people do not understand what they “do.” Typically they have a team of one other person or maybe they even are the sole counselor in the school. Due to confidentiality, they do not share much about what happened during their day. They are not teachers but not administration. School counselors are floating around on their lonely little iceberg and you know what — it’s okay. It’s okay because passion drives them and keeps them centered on the big picture of knowing that students are supported and achieving academic success because of their unique place and role. Yes, it might be a little lonely or frustrating at times to not quite “fit in” with any one school group, but overall — the ice is nice. They have perfected the face. The face that says “I do not judge.” The face that says, “I am open and willing to listen.” The face that holds back bias, frustration, anger, pain, fear, joy, excitement, sadness, etc., from whomever is sitting across from you, sharing with you, confiding with you. It’s not that we don’t show emotion. It’s that we have learned that showing our feelings can halt the process. So, we sit in neutrality and show that on our face. They trust the process. School counselors know that we are just one little piece of a big puzzle for many of our students. We do not expect revolutionary change. We do not expect miracles. We trust that there is value in the work we do and that we are positively impacting the students and school community even if we never see major or direct results. They know they are bigger than the word guidance. Guidance is an outdated, antiquated term that refers to getting people into post-secondary education. School counseling is a comprehensive program where trained, certified individuals support all school stakeholders in the academic, social-emotional, career, and global (internationally) domains. We are not antiquated. We are current. We are the future. The list could go on an on. Maybe I am biased but I still believe that school counselors are vital pieces of the school community web. Why do you appreciate your school counselor? What is a skill they possess that makes them a key stakeholder at your school? Inspired by Edna Sackson’s latest blog post To Teachers Everywhere and tailored to the wonderful educators at our school specifically. To the educator who gives up part of their weekend to support their students’ action. We see you. To the educator who stands at the door to greet each and every student, each and every day. We see you. To the educator who goes out for extra duties, often just to play with students. We see you. To the educator who has a PYP binder full of notes, highlights and post-its. We see you. To the educator supports student learners with an array of interventions, techniques, modifications, and strategies within the classroom. We see you. To to the educator who gives up part of their morning prep to offer extra support to their students. We see you. To the educator who is often here until 6:00 pm each night. We see you. To the educator who comes in every Saturday. We see you. To the educator who has “taught” other staff about giving and sharing. We see you. To the educator who gets behind in their own work because they are busy supporting their new team members. We see you. To the educator who nurtures students and supports their emotional learning. We see you. To the educator who takes time to provide meaningful feedback on a daily basis to the parents of a struggling student. We see you. To the educator who throws away their lesson plan to follow a student-led inquiry. We see you. To the educator who is dealing with parents who may not yet understand how we teach in the PYP, yet perseveres and stays true to what they believe is best for students. We see you. To the educator who is sitting at their computer not booking trips or checking facebook – but instead reading blogs and posting on Twitter. We see you. To the educator who apologizes to their students when they make a mistake. We see you. To the educator who gives up their break to help a student, even though you haven’t eaten or gone to the bathroom in hours. We see you. To the educator who looks at each student holistically and supports her/his social-emotional and behavioral development alongside the academic. We see you. To the educator who stops at every classroom after school to check in with coworkers and make sure they are getting the support they need. We see you. To the educator who gives time, self, money, resources to students, parents, coworkers, and administration from the good of the heart — never seeking praise. We see you. To the educator who refuses to label or make generalizations about groups of students. We see you. To the educator who uses humor with students and is never afraid to break the tension with a joke. We see you. To the educator who is dealing with challenging situations in personal life but never lets it impact student learning and professional responsibilities. We see you. To the educator who has been teaching for many years, but gave up old practices and adopted new ones. We see you. To the educator who refuses to embarrass or humiliate students. We see you. To the educator who gives up time with family and children to support school-wide initiatives and programs. We see you. To the educator who spends precious prep time promoting health and creating new athletic opportunities for students. We see you. To the educator who refuses to believe that early learners are not capable of deep, critical thinking. We see you. To the educator who has spent countless hours building a classroom community built around mutual respect, caring, and compassion. We see you. To the educator who may be quiet during sharing times at meetings, but has amazing learning happening in their classroom. We see you. To the educator who takes risks and tries new things they may have never dreamed of doing in their classroom. We see you. To the educator who went a different direction from the rest of their team because they felt it was better for students. We see you. To the educator who dreads dust days and unexpected holidays because it takes away from learning time. We see you. To the educator who let their students redesign their classroom and their schedule part way through the year. We see you. To the educator who is never satisfied with her/himself as a teacher and spends endless hours trying to improve. We see you. To the educator, who takes the time to tie a shoe, pick up a book, carry a bag. We see you. To the educator who maintains and practices confidentiality with students and coworkers. We see you. To the educator who lives, breathes, practices, and promotes inquiry with student and adult learners. We see you. To the educator who refuses to countdown to holidays because they believe in the power of each instructional day. We see you. We may not always take the time to say it, but we see you and appreciate all the amazing things you do for the students at our school. I am always looking for new strategies and ideas to help students unpack their thinking. Recently, I had the opportunity to deliver counseling lessons in grade 3 classrooms. The Unit of Inquiry was “Who We Are” and the central idea was “Decisions determine consequences.” The grade 3 team noticed that many students were struggling with tattling. When in a collaborative planning session, they asked if classroom counseling lessons could be tied into their unit because when students tattle, they experience natural consequences — often in the form of negative feedback — from peers. It was decided that through the counseling and social-emotional lens, students would inquire into the ideas of tattling vs reporting. As I began to think about the counseling lessons, I realized that tattling and reporting are big concepts for grade 3 students to comprehend. I began to think of all the visible thinking routines, protocols, and strategies I had in my toolbox to help students think about their thinking and make meaning out of these two big ideas. I began to reflect that many routines like See, Think, Wonder and Chalk Talk have already been used numerous times by the teachers this year. I wanted to try something new to help students tap into prior knowledge, learn from their peers, and begin to make sense of what they know and what they don’t. Enter an awesome member of my professional learning community, The Relevant Educator, who suggest I try using a Graffiti Wall. 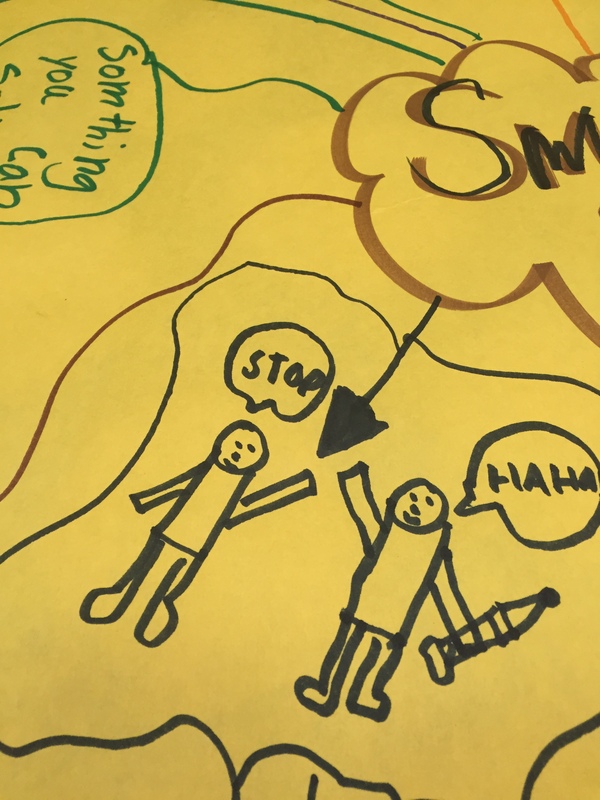 A graffiti wall is a thinking strategy where students use pictures, powerful words, symbols, and colors to share their thoughts and connections around a specific topic. 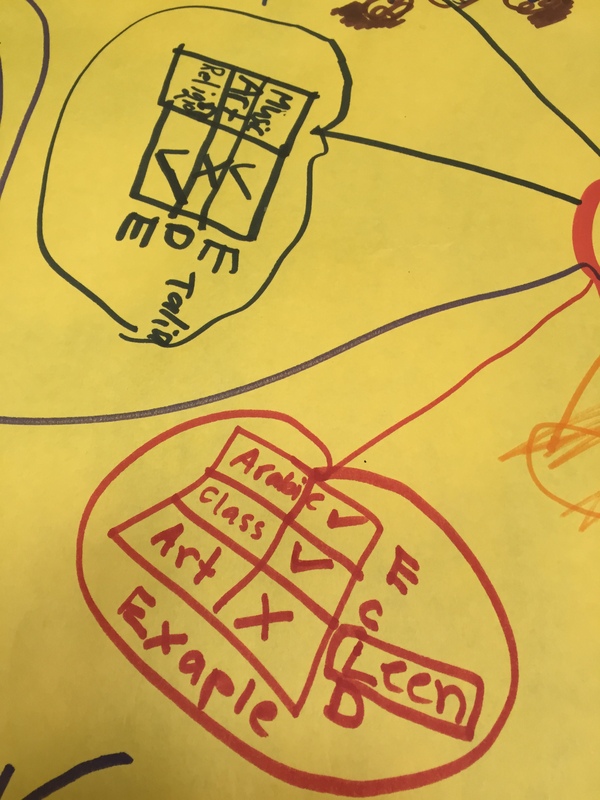 Similar to a chalk talk, students work on a large piece of paper to create an individual and collective understanding and unpacking of a big idea. “Brilliant,” I thought. Grade 3 would be my new strategy guinea pigs. Since the inquiry was around “tattling” and “reporting,” two large pieces of butcher paper were hung on the wall with these words in the center. Since we use Kelso’s Choice as a school wide problem solving method, two additional posters were created with “Big Problem” and “Small Problem” as the prompt. Bright colored markers were placed by the posters, as well. Students were fully excited and engaged in the activity. Due to the familiarity with a chalk talk, they instantly got to work on sharing their understanding on the “graffiti wall” through pictures and powerful phrases. I facilitated when to rotate to the next poster so that students were spread out working on all 4 rather than having 22 students en masse at one. Every student had the opportunity to share their understanding on each poster. After the time was up, we moved back together as a group to share some of our thoughts, what we noticed about what our classmates shared, how our understanding of the concept word changed, was challenged, or grew. We then formed a working definition of each term — tattling, reporting, big problem, small problem — based on their images, dialogue, and connections which became the anchor for the rest of our counseling lessons. Big problem example. Those are bees attacking the student. Creatively using a horse and owl to solve problems. This wall clearly shows that reporting is thought of as only report cards. Having the prior knowledge and experience with a chalk talk was both a help and a little bump. It helped students as they already knew the butcher paper was a working document to share their ideas. They understood there was no “correct” answer but just a medium to make sense of their thinking. It was a little challenging in that students wanted to write their thoughts and ideas in detailed sentences instead of drawing, coloring, using powerful words. Also, some students simply wanted to star, check, or put a smiley face by other student’s drawings (as you do in chalk talks) instead of share their own images. This really upset some students that certain student pictures were “liked” while others were not. I should have allowed more time. Students felt rushed and like they could not get all their images completed in the manner they wanted or needed. They also needed additional time, at the end, to view their peer’s work and see other thinking. 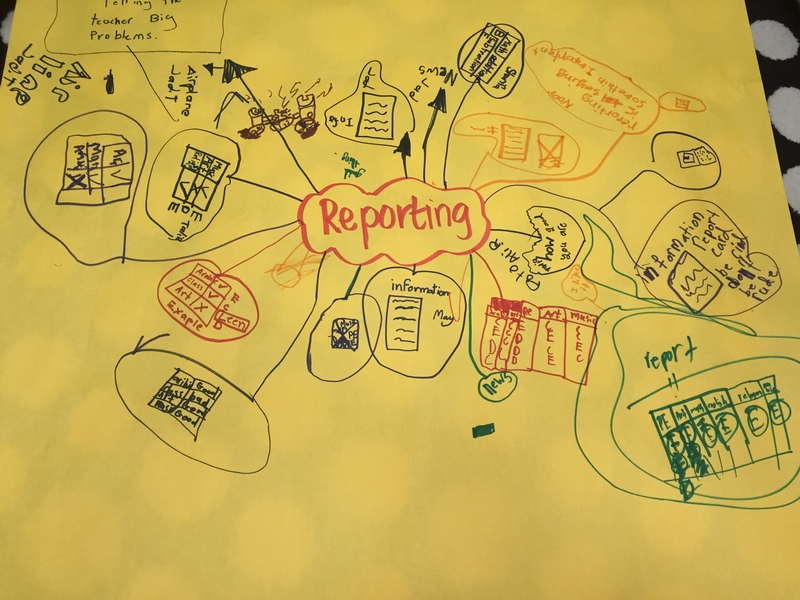 It was clear that students had no real concept of “reporting” in the context we were discussing it. Therefore, we spent more time discussing this concept and coming to a working definition for our counseling lesson. Due to the size of the paper and how it hangs on walls (like graffiti), the teachers could not leave the papers up in their rooms for further investigation. This activity does require space. Overall, I was glad I was a risk-taker and tried a new strategy to help students unpack their thinking. I do believe it was successful in making sense of thoughts and ideas and challenging misconceptions. 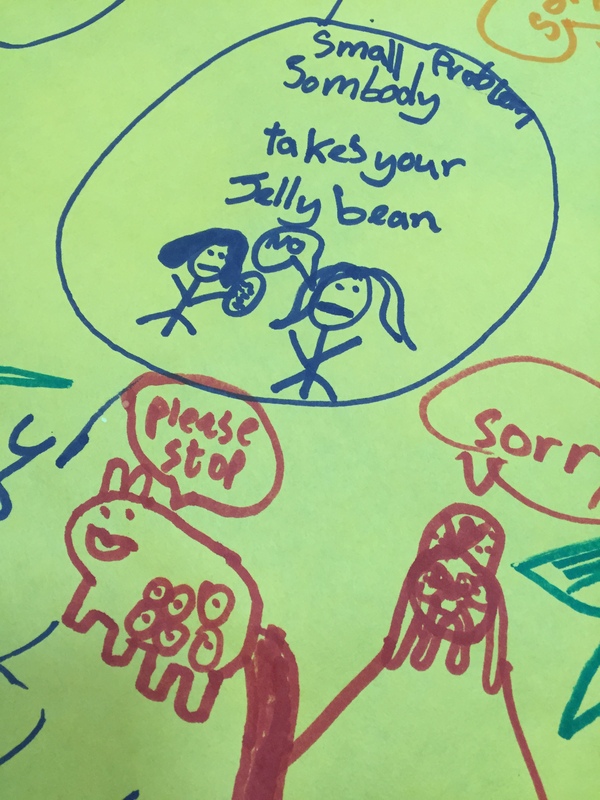 I had students report they enjoyed the drawing (and some got pretty creative with their images). I think with some fine tuning, this activity will definitely be used again in both a classroom and group counseling setting. Small problem art. Not sure what is in the student’s hand but he/she is choosing one of Kelso’s Choices. Startling statement: Whole class behavior management plans cause your students to need counseling. Let me state that again. When a teacher chooses to use a whole class behavior plan — move the clip, flip the card, Class Dojo, beans in a jar, table points, class points, etc., etc. — it can impact a student so much that they need to seek the intervention of counseling. In the last month, I have been approached by three different parents who have students at our school. These students are in different grades, different classes, and in no-way are connected to each other — friends, family, classmates. Each parent has sought me out to share their concern about their child and the student’s outlook on school. While each situation is unique and different, there is commonality — the fact that a whole-class behavior system has negatively impacted their child. In fact, each student is so impacted that the parent requested individualized counseling to help shift the student’s self-perception and school-perception from negative back to positive. A student was in a class where a behavior clip-chart was used. The teacher made it clear that the students could move up the chart when an individual’s behavior was above and beyond the expectation. The students could also move down the chart when the individual’s behavior was off task or not meeting the classroom expectations. Often, this one student was moved all the way to the “bottom” of the chart where his name was placed on the red circle. 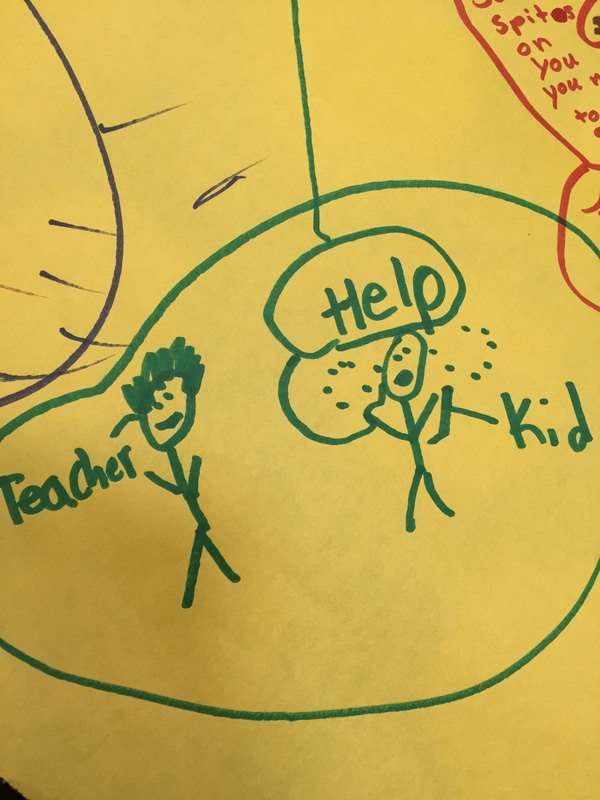 This meant the student had reached the bottom and his behavior was so “bad” that he could not possibly get any worse (well, according to this teacher and this chart). So now, a new year and new grade and this same student still finds himself without friends and not being invited to playdates. The social shaming that occurred was due to this child always being labeled as “bad” in public and then — through the power of repetition — perceived as true by his peers. This student now meets with me to help rebuild his self-image, belief in his ability to demonstrate positive behaviors in school, and to build social-skills around how to make new friends. Thanks, whole class clip chart. You helped alienate this boy from his peers. The teacher uses table points as a whole class management strategy. Be on-task, the quietest table, the quickest to clean up, the group who finishes their work first. Your whole group does this — you get a coveted point. What are the points used for? A party, a treat, free time. It does not matter but your success or failure is tied to 3 or 4 other individual’s success or failure. Once again, after experiencing this for a few weeks, a girl’s parents approached me very concerned that their daughter always seems to be anxious about coming to school and upset when she returns home. When they asked why, their child shared all about table points. This student gets so anxious, frustrated, and upset by having to wait for her 3 table mates to do what the teacher expects/asks (ultimately never doing good enough to get the “table point) that she does not want to be in class. She told her parents “I would rather just sit alone.” The parents asked the teacher if this request for an individual table could be granted and the teacher reported that learning to work in a group is a needed skill. Therefore, no, their daughter would be expected to continue in the group setting (and for her behavior “success” to only be depended upon the behaviors of 3 of her peers). Now the student meets with me to help her with her anxiety and build some stress-release skills she can use in class. We talk about the perceived importance of table points and how she can re-focus on her celebrating her choices, behaviors, and ability to follow teacher directions and try to not worry about her peers. This is hard to do, though, when a carrot of a party, free time, or treats is being dangled. So, the counseling continues. This student is a model of engagement. He loves everything about school. He actively inquires, makes meaning, participates, and takes action to apply his knowledge. His is vibrant, passionate, and radiates zeal for learning. Or maybe I should say, that was him. Now, thanks to a whole class behavior strategy of all being penalized for the actions of a few, this student is different. Parents report he no longer wants to get out of bed in the morning. He has faked sick three times to go home. He becomes grumpy and moody when his parents try to ask him how his day was. They suggested he talk to a counselor. Here’s where I enter. After meeting with the student, he finally disclosed that the real issue is that “he is always in trouble.” However, this is for nothing he does but rather, the fact that the teacher has a whole class management strategy that when a few students are off task, all students’ heads go down on desks and lights get turned off until ALL students can settle. Even at this young student’s age, he can articulate that this strategy does not make sense. When many students are demonstrating expected behavior, why are they being “punished” like the ones off task? Why, when he always does what is expected, does he have to stop his learning/inquiring/exploring to put his head down? He feels embarrassed. He feels shame. He feels tired of being lumped with the other students. He feels frustrated the teacher never comments on his positive behaviors. He feels like giving up. Guess what? He is. If I were the student, what are all the ways I could be impacted by this whole class intervention? How would I feel to be the student always in trouble? The student always on task? How would this impact me socially? What message about behaviors do I want to promote to my students? How does my plan change undesired behaviors to desired behaviors? When it comes to school counseling resources, the cup overfloweth. There are blogs, books, webinars, chats, Pinterest pages and conferences galore related to school counseling. If you need assistance in coming up with a group counseling session, stand alone guidance lesson, or parent chat, all you have to do is visit Google, and BOOM, you have what you need. When it comes to resources for international school counselors, though, things are looking a little more dry. Not only does there seem to be a lack of resources related to international school counseling but there seems to be even less for school counselors in IB schools. Here is where I come in. Instead of being frustrated and heading down the never ending rabbit hole of searching resources that may or may not align to an international counseling program, I decided I would take the matter into my own hands and start a blog with an international counseling and IB focus. The goal is to connect international counselors, create a space for resources and ideas, and advocate for the counseling role in international school settings. So, sit back, get ready and let the globally minded counseling world flow.